I did quite a few things my last wash day. If you follow me on Instagram, you know I suddenly decided to try bangs. It was protein wash day, so I continued my protein layering regimen. And lastly, I did a tea rinse (with garlic) to decrease shedding. 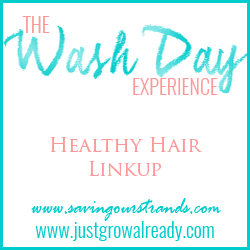 With my current schedule my wash days have been on Thursday, so this'll be a recap. It's been about three weeks since the start of my Protein Layering challenge, and accordingly, I did a protein treatment on the bottom half of my hair last wash. The protein layering method I've been doing is applying protein by gradually working up the hair length every protein wash day (visit here for an illustration). Aside from protein layering, I've also been focusing on reducing shedding my last few wash days. I've been having an increase in hair loss lately (nothing big, but noticeable) and from analyzing the loss strands I see the majority is shedding. Not sure if it's a seasonal thing or change in my diet, but I've been doing tea rinses to try and combat it (that and trying to remember to take garlic supplements). Tea Rinse/ Prepoo - Created a tea rinse made of fennel tea, hibiscus tea, nettle tea, peppermint tea, and juiced garlic and poured it over my head, focusing on my scalp. That sat for about an hour. Oil Rinse - Poured some grape seed oil over my hair while still in the shower, wanting it to be damp and a little oily before applying my henna gloss. If you follow the henna gloss link above, you'll see I use Aveda's Black Malva Conditioner in it in attempt to get darker undertones. I have never updated how this idea worked for me because, well, I still don't know if it works. I've been having a dilemma of trying to take before and after pictures of my hair's undertones. From what I can tell from the before and after pictures I attempted to take this wash, there isn't much of a difference. Maybe next time I attempt it I'll do it more like a two step henna treatment, using the black malva instead of indigo. The hair care knowledgeable might have noticed I didn't use black tea in my mix, when it's the most known tea to help combat shedding. Black tea rinses have helped me in the past when I noticed an increase in shedding, but recently, not so much. When I first started doing tea rinses to combat this period of increase shedding, I was only using black tea. I wasn't noticing any improvement this time, not sure why. With the fennel, nettle, and garlic juice mixture I have now, however, I have noticed slight improvement. I plan on continuing to change it up though, until I find the tea rinse recipe that works best for me. I'm happy to see that you are keeping up with the protein layering. This post reminds me that I need to be better about doing that. Congrats on your bangs! They're uber cute! HI Yahya,I'm drolling over your hair and your site is great,I've gained so much information from it. My question, I've seen it mentioned that henna may interfere with the effectiveness of the Japanese straightening.have you found this to be true? Medicals.com is your online wellspring of wellbeing and excellence needs. We take pride in realizing that every client has an awesome involvement with hair care products. Our main objective is to offer the best client administration experience accessible. We convey more than 10,000 items from a wide exhibit of lines to offer clients the best alternatives for their wellbeing. We are resolved to grow our stock to more than 25,000 items inside of this current year from now. We endeavor to offer clients the most moderate delivery we can. We are always working with our transportation accomplices to improve rates so they can be passed onto the clients. I recently got a successful PRP Therapy in Chandigarh and my self confidence is higher than it has ever been! It's such a relief to finally find something that works. Geez.. your hair is super long! Have you tried Hair Growth Treatment or it just grew naturally with the mask? One question, how many times do you do the tea rinse? Now from the Satyam Hair Transplant Centre people can easily get the best and cheap cost hair transplant in Chandigarh. We are the only clinic in India from where you can get the 100% successful results without spending any extra money from your pocket. So visit our website now and make your appointment with us. People who are still facing the hair loss problem and want the best results they can directly make their appointment with the Satyam Hair Transplant Centre. We provide you permanent results with hair transplant in India at affordable cost. We give you scar-less results using the modern methods that give you perfect look within the time period.